Hamilton Accies retained their recent upper hand on their Lanarkshire rivals Motherwell, securing victory in a closely contested encounter. Dougie Imrie's looping header proved the difference between the teams. The result moves Accies six points clear of their opponents and continues a long unbeaten home run, now stretching to nine games. Motherwell's lack of goalscoring threat once again proved to be their downfall as they fall to 10th. Only bottom side Partick Thistle have scored fewer than Ian Baraclough's side, with the two set to meet at Fir Park next weekend. In truth, this was a game of few chances at either end, but crucially Imrie took one of those created by Accies. Antons Kurakins swung in a deep cross from the left and the winger climbed above Joe Chalmers to head past Motherwell goalkeeper Connor Ripley. The visitors had survived two big scares in the first period, which was otherwise low on thrills. Lucas Tagliapietra thought he had given Accies an early lead as he headed Ali Crawford's free kick into the net, but referee Craig Thomson awarded a foul for an infringement on Ripley. And then, late in the half, Crawford hammered a left-foot shot off Ripley's bar from just outside the box. Following Imrie's strike, Ripley did well to push away Greg Docherty's fierce shot, to keep Motherwell in the game. But save for a late penalty shout for handball by Tagliapietra, they scarcely looked like salvaging anything from the match and on current form could be heading for another battle at the bottom end of the table. Match ends, Hamilton Academical 1, Motherwell 0. 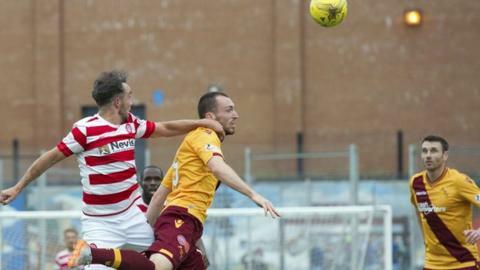 Second Half ends, Hamilton Academical 1, Motherwell 0. Corner, Motherwell. Conceded by Christian Nade. Substitution, Hamilton Academical. Louis Longridge replaces Greg Docherty. Lucas (Hamilton Academical) wins a free kick in the defensive half. Substitution, Motherwell. Dom Thomas replaces Lionel Ainsworth. Attempt missed. Gramoz Kurtaj (Hamilton Academical) right footed shot from the left side of the box is just a bit too high. Substitution, Motherwell. Scott McDonald replaces Keith Lasley. Substitution, Hamilton Academical. Jesus Garcia Tena replaces Darren Lyon. Corner, Hamilton Academical. Conceded by Liam Grimshaw. Attempt saved. Greg Docherty (Hamilton Academical) left footed shot from the centre of the box is saved in the centre of the goal. Attempt saved. Darren Lyon (Hamilton Academical) right footed shot from the centre of the box is saved in the centre of the goal. Goal! Hamilton Academical 1, Motherwell 0. Dougie Imrie (Hamilton Academical) header from the right side of the six yard box to the high centre of the goal. Assisted by Antons Kurakins. Substitution, Motherwell. Marvin Johnson replaces Theo Robinson. Jake Taylor (Motherwell) wins a free kick on the left wing. Attempt missed. Ali Crawford (Hamilton Academical) right footed shot from the centre of the box is too high. Corner, Hamilton Academical. Conceded by Theo Robinson. Attempt saved. Kieran Kennedy (Motherwell) header from the centre of the box is saved in the top centre of the goal. Attempt saved. Theo Robinson (Motherwell) right footed shot from the centre of the box is saved in the bottom left corner. Greg Docherty (Hamilton Academical) is shown the yellow card.